Roy, Patricia E.. "Internment in Canada". The Canadian Encyclopedia, 18 January 2019, Historica Canada. https://www.thecanadianencyclopedia.ca/en/article/internment. Accessed 22 April 2019. Internment is the forcible confinement or detention of a person during wartime. 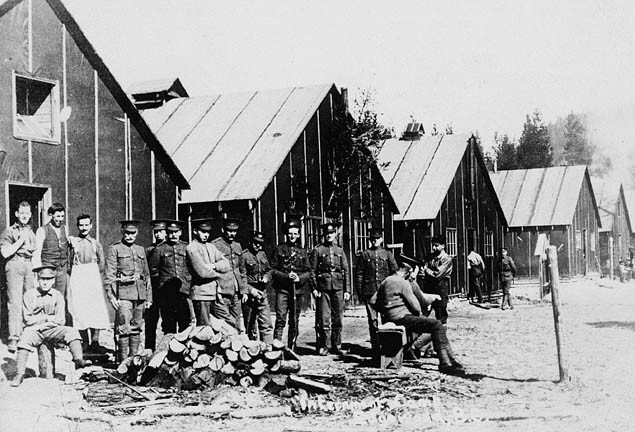 Large-scale internment operations were carried out by the Canadian government during the First World War and Second World War. In both cases, the War Measures Act was invoked, which gave the government the authority to deny people’s civil liberties, notably habeas corpus (the right to a fair trial before detention), and to hold them in camps across the country. More than 8,500 people were interned during the First World War and as many as 24,000 during the Second World War — including some 22,000 Japanese Canadians. Morrissey Internment Camp, BC, ca. 1916-18. At the beginning of the First World War, the federal government passed the War Measures Act, which was officially in force from 4 August 1914 until 10 January 1920 — the official date of the end of the war with Germany. The new law gave Cabinet sweeping powers to suspend civil liberties and govern by order-in-council, meaning they could make laws without the approval of Parliament. 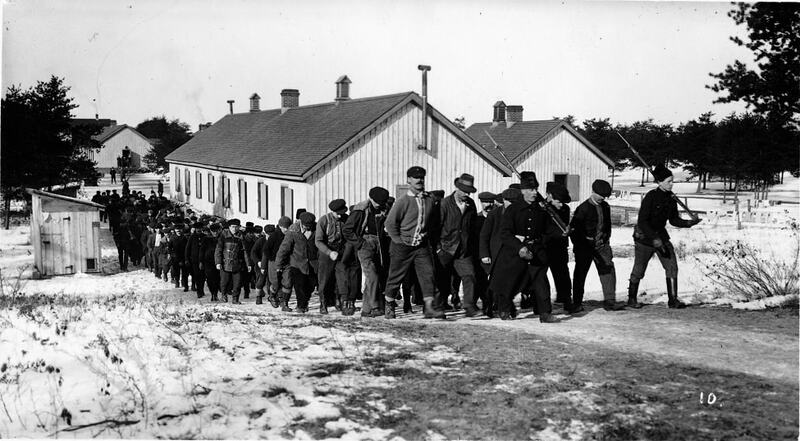 Internees being marched off to dinner at the Petawawa internment camp during the First World War. 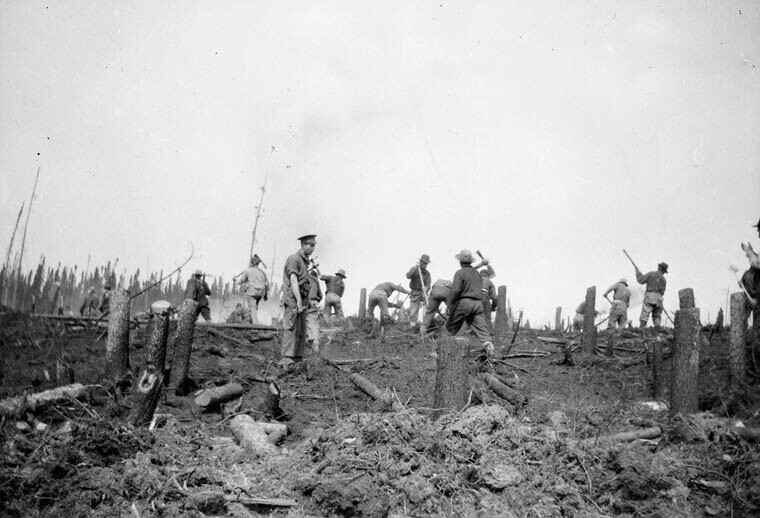 Clearing wood at the Spirit Lake Internment Camp, Abitibi, Quebec, ca. 1914-20. 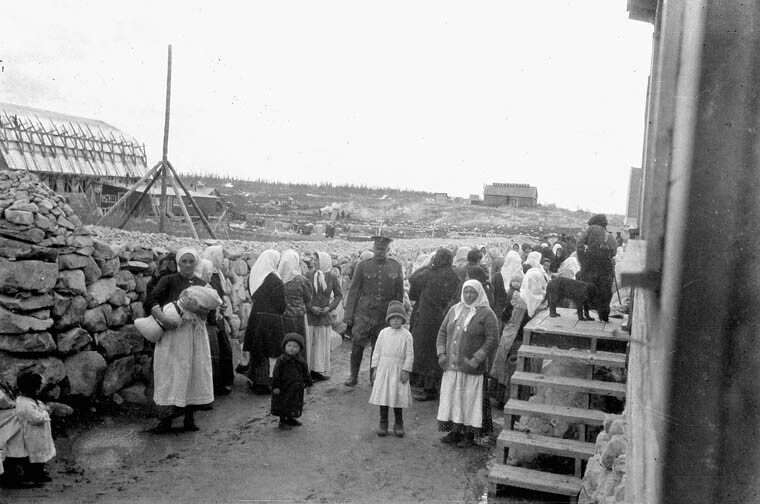 According to official records, 8,579 men were held at 24 internment camps and receiving stations across Canada, including 5,954 men of Austro-Hungarian origin, the majority of whom were Ukrainian; 2,009 Germans; 205 Turks; and 99 Bulgarians. As well, 81 women and 156 children — the dependants of male internees — were voluntarily interned. Other internees included homeless people, conscientious objectors and members of outlawed cultural and political associations. Women and children prisoners at the Spirit Lake Internment Camp, Abitibi, Quebec, ca. 1914-1920. Although responsibility shifted in 1915 from the Department of Militia and Defence to the Department of Justice, Major General Sir William Otter remained in charge of internment operations. Approximately 80,000 people, mostly Ukrainian Canadians, were obliged to register as “enemy aliens” during the war. They were compelled to report regularly to the police and were subjected to other state-sanctioned censures, including restrictions of their freedom of speech, movement and association (see Ukrainian Internment in Canada). The term enemy alien referred to people from countries, or with roots in countries, that were at war with Canada. During the First World War, this included immigrants from the German, Austro-Hungarian and Ottoman empires and Bulgaria; during the Second World War, people with Japanese, German and Italian ancestry. Internees also had their property confiscated, much of which was not returned at the end of the war. They were often required to work on large labour projects — even building a portion of the golf course	at Banff National Park — as well as building roads, clearing bush, cutting trails and working on logging and mining operations. They were paid less than half the daily wage offered to other labourers. 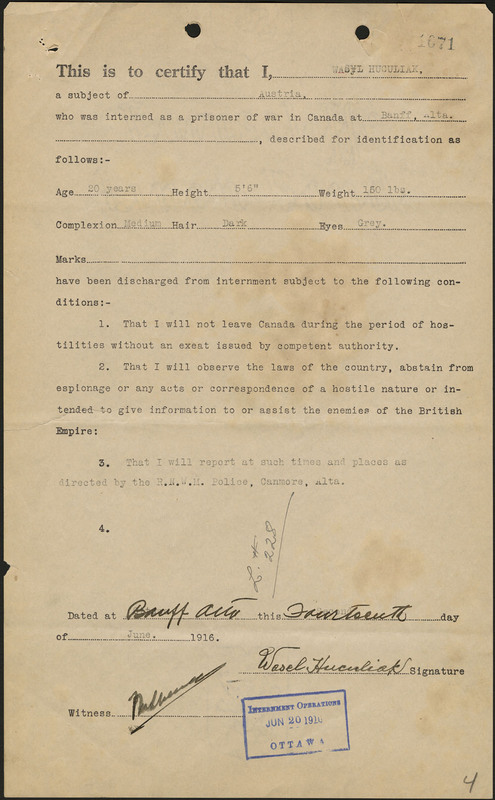 Wasyl Hasiuk's certificate of release from the internment camp at Kapuskasing, Ontario, 14 June 1916. The Canadian government invoked the War Measures Act during the Second World War. The Act was used to implement the Defence of Canada Regulations, which gave the Minister of Justice the authority to detain anyone acting “in any manner prejudicial to the public safety or the safety of the state.” As a result, both enemy nationals and Canadian citizens were subject to internment. More than 40 camps held an estimated 24,000 internees. Most of the German Canadian internees were members of German-sponsored organizations or leaders of the National Unity Party (the Canadian Nazi Party). Hundreds of Germans on Canadian soil were accused of spying and subversion. The camps also served to house captured enemy soldiers, including over 700 German sailors captured in East Asia and sent to Canada. As well, German immigrants who had arrived in Canada after 1922 were forced to register with the authorities, 16,000 registered. After Italy entered the war in June 1940, several prominent Italians were interned. Approximately 600 Italian men suspected of sympathizing with fascism were placed into three camps: Kananaskis, Alberta; Petawawa, Ontario; and Fredericton, New Brunswick. Some 31,000 Italian Canadians	were registered as enemy aliens and forced to report to local registrars or to RCMP stations once a month. In the summer of 1940, more than 3,000 refugees — among them 2,300 German and Austrian Jews aged 16 to 60 — were transported to Canada and interned in guarded camps in Ontario, Quebec and New Brunswick. The “accidental immigrants,” as the Jews in the group came to be known, were initially interned in prisoner of war (POW) camps alongside actual POWs, including Nazi Germans. 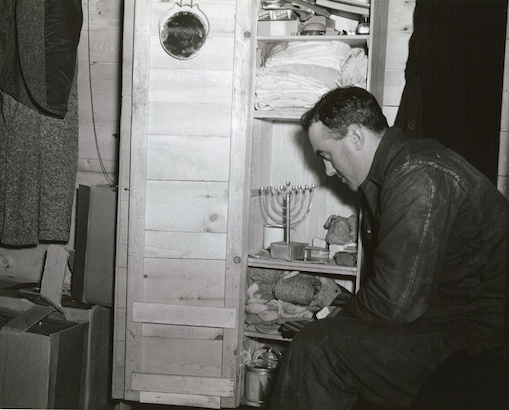 A Jewish internee sitting beside his cupboard made out of packing cases, location unknown, c. 1940\u201343. 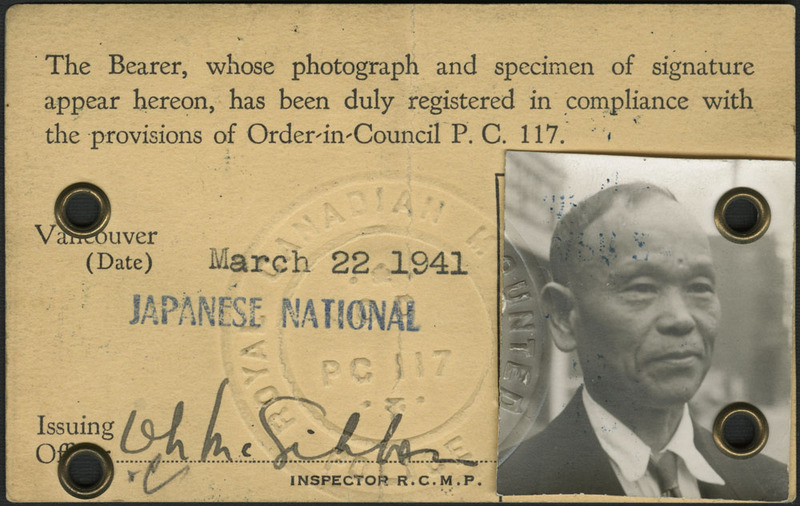 In March 1941, following a recommendation from the Special Committee on Orientals in British Columbia, a federally appointed advisory group, Ottawa required all Japanese Canadians, irrespective of citizenship, to register with the government. In effect, this declared Japanese Canadians to be enemy aliens. Internment identification card of Taka Sakamoto, 24 March 1941. Internment identification card of Tokutaro Sakamoto, 22 March 1941. Immediately after Japan attacked Pearl Harbor and Hong Kong on 7 December 1941, the RCMP interned 38 Japanese nationals. Later, an additional 720 Japanese, mainly Canadian citizens and members of the Nisei Mass Evacuation Group who resisted separation from their families, were imprisoned. 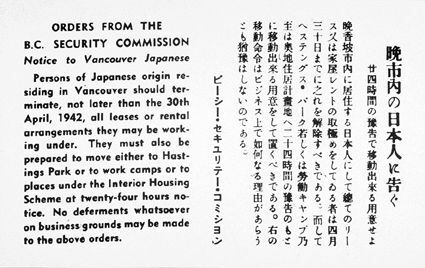 Orders from the BC Security Commission, which appeared 29 April 1942 (courtesy Ken Mori/"The New Canadian"). On 24 February 1942, Cabinet ordered Japanese Canadians to move 100 miles inland from the Pacific Coast. 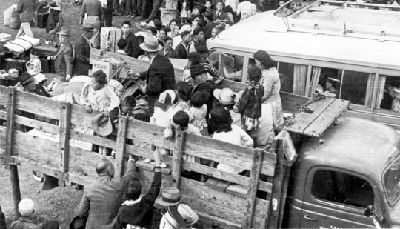 The order	led to the expulsion of some 22,000 Japanese Canadians from their homes. Sixty-five per cent were Canadian born. Many were housed in isolated areas and had their activities severely restricted. As well, the Canadian government confiscated and later sold Japanese Canadians’ property and pressured them to accept mass deportation after the war ended (see Internment of Japanese Canadians). 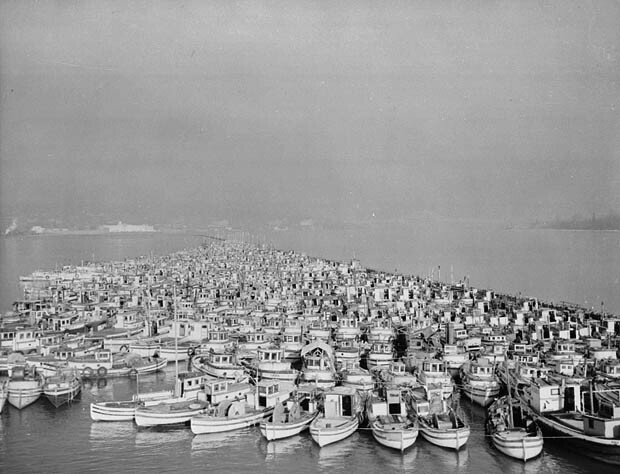 Fishermen's Reserve rounding up Japanese-Canadian fishing vessels in Steveston, BC, 10 December 1941. 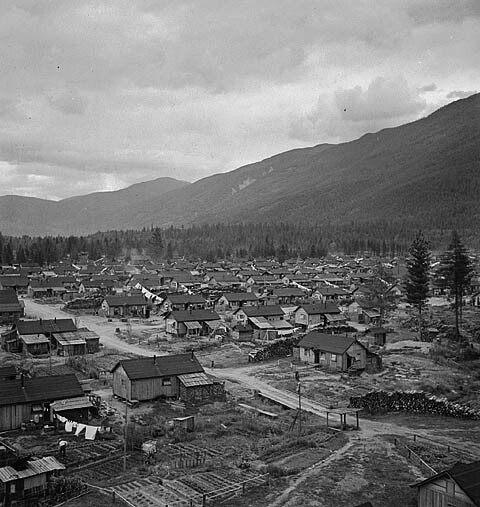 In 1942 the Canadian government moved to relocate all Japanese in British Columbia, seizing any property that the people could not carry (courtesy Erindale College Photo Collection). 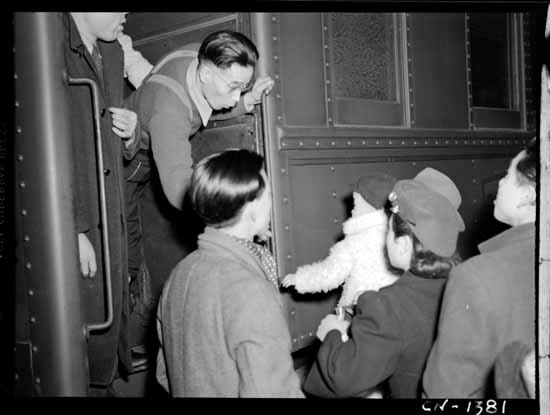 Even those Japanese who were Canadian citizens were relocated in 1942 (courtesy Library and Archives Canada/C-46350). 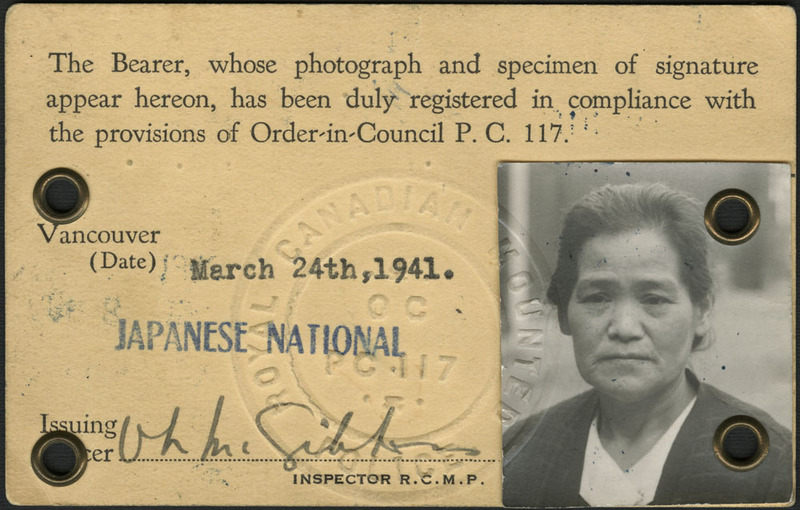 Various scholars and activists have challenged the notion that Japanese Canadians were interned during the Second World War because, under international law, internment refers to the detention of enemy aliens, whereas most Japanese Canadians were Canadian citizens (see Citizenship). Terms suggested instead include incarceration, expulsion, detention and dispersal. Because citizens could be interned for belonging to outlawed organizations — such as the Communist Party of Canada — some claimed that internment was used as a weapon against labour leaders. For example, J.A. “Pat” Sullivan, president of the Canadian Seamen’s Union, was interned in 1940. He was released in 1941, along with about 130 other communists, after the Communist-ruled Soviet Union joined the Allies. As well, almost 850 Canadian fascists, such as Adrien Arcand of Montreal, were also interned. Camillien Houde during civic elections, Montréal, 12 December 1938 (courtesy Library and Archives Canada/PA-116475). 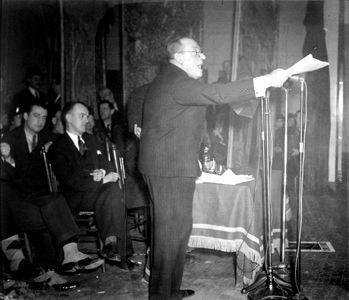 In one of the most high profile cases, Montreal Mayor Camillien Houde was arrested at city hall in 1940 and interned for four years in Ontario	for denouncing government policies that would lead to conscription. The army and the Secretary of State shared administrative responsibility for internment camps. A total of 26 camps operated in Ontario, Quebec, Alberta and New Brunswick. During the First World War, Canada had accommodated 817 internees from Newfoundland and British Caribbean colonies; during the Second World War, Canadian camps housed POWs and merchant seamen captured by the British, as well as some British civilians. At the peak in October 1944, Canada held 34,193 persons for Britain (see also Prison Ships in Canada: A Little-Known Story). In 1988, the War Measures Act was repealed and replaced by the Emergencies Act, which created more limited and specific powers for the government to deal with security emergencies. The Emergencies Act is different from the War Measures Act in some key ways. Under the Emergencies Act, Cabinet orders and regulations must be reviewed by Parliament, meaning the Cabinet cannot act on its own. The Act outlines how people affected by government actions during emergencies are to be compensated. It also notes that government actions are subject to the Canadian Charter of Rights and Freedoms and the Canadian Bill of Rights. 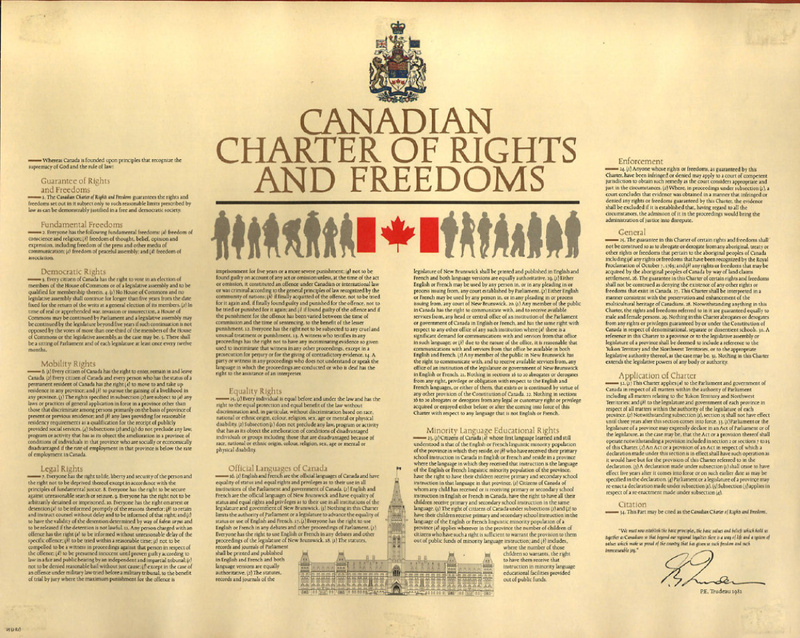 Copy of the Canadian Charter of Rights and Freedoms. In the decades following the world wars, Canadians who were interned and had their property seized began lobbying for compensation for and recognition of their wartime treatment. The Japanese Canadian redress movement resulted in an official apology from Prime Minister Brian Mulroney on the floor of the House of Commons	in 1988, as well as compensation. In the case of people interned during the First World War, a community settlement fund was established in 2008 to support commemorative and educational projects about Canada’s first national internment operations. 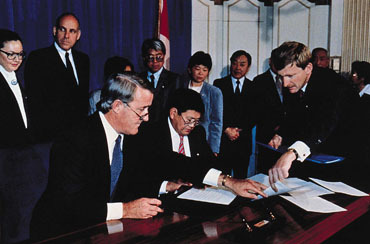 September 1988, Prime Minister Brian Mulroney signs the agreement to compensate the Japanese-Canadians for the expropriation of their property and their internment during World War II (photo by Mike Binder). D.J. Carter, Behind Canadian Barbed Wire (1980); Ted Jones, Both Sides of The Wire (1989). Canadian Internment CampsBrief history of Canadian internment and prisoner of war camps from the Petawawa Heritage Village website. 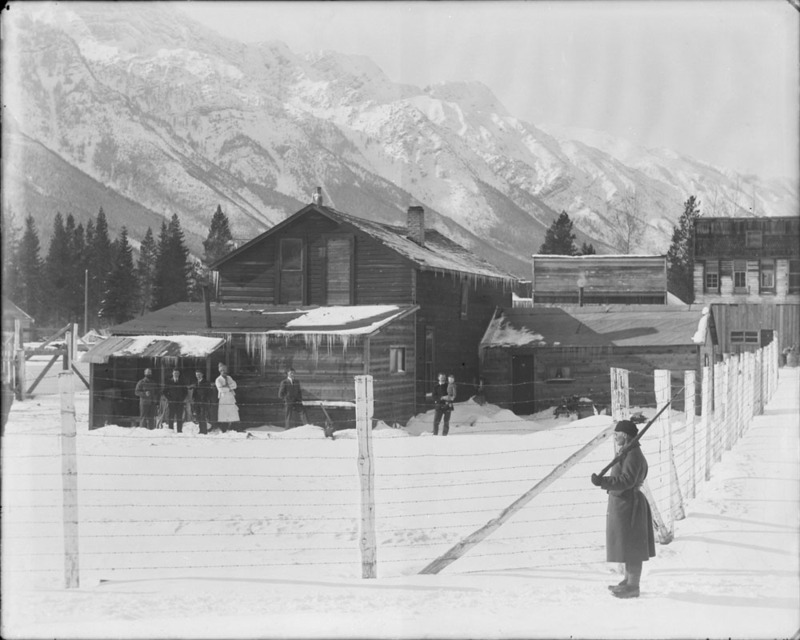 ENEMY ALIENS, PRISONERS OF WARInformation about an exhibit devoted to Canada's First World War internment operations in Banff National Park. From Parks Canada. RIGHTING A 70-YEAR WRONGAn interactive feature about the internment of Japanese Canadians and Japanese nationals during the Second World War. From the University of British Columbia. ANTI-GERMAN SENTIMENTAn online feature about widespread hostility towards German Canadians and German-Canadian culture that arose during the First World War. From the Canadian War Museum. LANDSCAPES OF INJUSTICEAn initiative dedicated to recovering and grappling with the forced sale of Japanese-Canadian-owned property during the Second World War.